1. Preheat oven to 350 °F and grease and line an 8-inch square pan with parchment paper. Spread the coconut onto a baking sheet and toast until outside edges of pan have browned. Toss coconut to mix in browned coconut with white and let cool. Increase oven temperature to 375 °F. 2. Whisk vegetable oil, 1 cup of coconut milk and egg yolks until evenly blended. In a separate bowl, sift flour, 1 cup of sugar, baking powder and salt. Add flour to coconut milk mixture and stir just until blended. Stir in 1 1/3 cups toasted coconut. In another bowl, whip egg whites with remaining ½ cup sugar until they hold a soft peak. Fold a third of the whites into the muffin mix until incorporated then fold in remaining whipped whites. Spoon batter into prepared pan and bake for 25 to 30 minutes, until top turn light brown and spring back when touched. 3. While still warm, brush top of cake with remaining 3 Tbsp coconut milk and sprinkle with remaining 1 cup of toasted coconut. Let cool completely before slicing. 1. Whip cream to soft peaks and add icing sugar, whipping until cream holds a peak when beaters are lifted. Stir in lime juice, coconut extract and lime zest. 1. 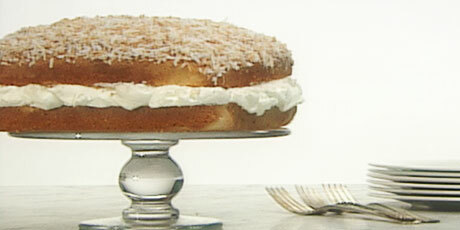 Prepare cake as above, slice in half horizontally and fill with Coconut Lime Cream for a fancy teatime treat.